After all this time, we arrive at the review of Acqua Di Gio and Chanel Bleu that may be after a long waited too. It is lucky also for you who are in condition of confusing the choice between these 2 luxury perfume, in order to buy both of them, you are in not enough budget. Do not worry about that because we seem to provide your needs and solve the confusion. Here we are Acqua Di Gio vs Chanel Bleu. Giorgio Armani Acqua Di Gio first launched in 1996 and over the years became a USA best seller fragrance. Was created from the inspiration of Giorgio Armani while on vacation to the island of Pantelleria, trying to catch the brightness of the sun and sandy horizons. 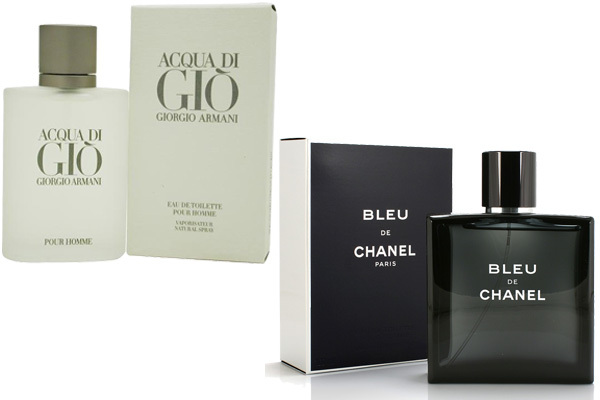 Acqua Digio included in Aromatic perfume types of Aquatic as yo can read also in Acqua Di Gio vs Acqua Di Gioia. The top Notes are composed of Bergamot, Neroli and Tangerine. When first sprayed floral citrus scent blend smells resh and crisp, Blends very well. Heart Notes comprise Jasmine Petal, Fruity Persimmon and Marine Note. Composition in the Heart Notes evoke the nuances of Salty aquatic mixed floral wrapped in the warmth of Fruity Persimmon woods, Fresh and Sensual, reminds you of the summer breeze and bittersweet power of the sea, sweet yet salty. Basenotes consists of Crisp Rock Rose, Rosemary, and Indonesian Patchouli. Make the aroma becomes increasingly warm with little hints would of freshness, dries down beautifully. The impression gained from the user it is Gio’s Acqua men masculine, calm-for men who engraved their own legends. Bleu de Chanel is a kind of sophisticated and contemporary fragrance from Chanel that produced out of the market in 2010. Chanel introduces its enhanced version, Bleu de Chanel Eau de Parfum exactly right in summer of 2014. The fragrance is dedicated to freedom, endless, deep and boundless. It has woody-aromatic composition created by Jacques Polge follows the current original path but it goes down into a sensual and oriental amber territory. The wood maintains freshness of the original in this fragrance, it also enriched with depth and velvet amber woods. The fragrance is available in 2 choice of packaging such as 50 and 100 ml Eau de Parfum. This one can hit all of the main points for being a modern masculine scent sold in malls, but then also adds excellent performance for the lovers. Sweet, spicy and fresh feel when you use it and can easily identifiable also get noticed as well, so don’t be surprised if someone asks you if you’re wearing Bleu. Acqua Di Gio is basically the new ck one as every other person smells like it but it’s nice. While Chanel Bleu is a little more pricey so it is more uncommon for us. Back in back, means that all choice is according to people’s taste that we know it is totally different to each other even for perfume or fragrance too.